Gallery Title – This field is for internal use only. It won’t be visible to your users. Give your gallery a name that will help you find it in the future. Gallery Description – This field is for your internal use and SEO meta data. It won’t be visible to your users. Describe your gallery in a way that will help you find it in the future. Video Player Max Width – The video player is fully responsive and by default will automatically fill the max width of container where embedded. Use this field if you want to override the default and define your own video width. Auto Start Mode – In Auto Start mode, your video starts playing automatically when the page is loaded, so the user doesn’t have to click on the ‘Play’ button. Auto Start is turned OFF by default. Use the toggle to turn it ON. Advanced settings is based on the template you selected. 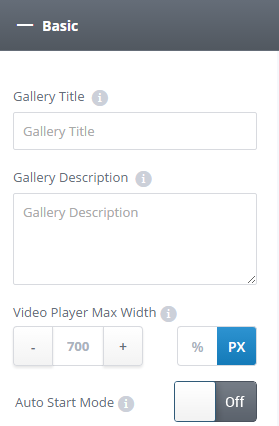 Below is the advance settings for a video player gallery. Show Playlist – By default player comes with a playlist. To deactivate the playlist change the toggle button to ‘Off’. Player CSS code – Open CSS editor to directly edit the video player CSS code. Show Control Bar – By default when player is not active the player control bar is hidden. To show control bar when player is not active change the toggle button to ‘On’. Facebook Mode – In Auto Start mode, your video starts playing automatically in silent mode when user scrolls over the player. Use the toggle to turn it ‘On’. NOTE: For more details about Facebook Mode feature please click here. Player Always on Top – With Always on top video player users will have a floating fully customizable window with playing video inside while they scroll over the content on page. Use the toggle to turn it ‘On’. Floating Window Margin Top – Define the margin size of floating window from top of the screen. Floating Window Margin Right – Define the margin size of floating window from right of the screen. NOTE: For more details about Always on Top feature please click here. Show Previous Button – By changing the toggle button to “Off” the “Previous” button won’t be visible in the player control. Show Play / Pause Button – By changing the toggle button to “Off” the “Play/Pause” button won’t be visible in the player control. Show Next Button – By changing the toggle button to “Off” the “Next” button won’t be visible in the player control. Show FullScreen Button – By changing the toggle button to “Off” the “Full Screen” button won’t be visible in the player control. Show Shuffle Button – By changing the toggle button to “On” a “Shuffle” button will become visible in the player control. Show Playlist Button – By changing the toggle button to “On” a “PlayList” button will become visible in the player control. Play Video in Loop Mode – In Loop mode when your video player reaches last video in playlist it will automatically move to the first video. To activate ‘Loop’ mode use the toggle to turn it ‘On’. Start on Shuffle Mode – Shuffle mode means player will switch between video from the playlist randomly. To active “Shuffle” mode change the toggle button to ‘On’. Share Button – Use share buttons to grab your visitors attention and increase sharing across devices. Mobile Native Player – By changing the toggle button to “On” mobile devices will display their own native player instead of Cincopa player design. Show Volume Button – By changing the toggle button to “Off” the volume button will get hidden in the player control. Show time control – By changing the toggle button to “On” the time control indicating video length and time progress will become visible in the player control. Show Progress Indication Bar – By changing the toggle button to “Off” the progress indication bar will get hidden in the player control. Progress Indication Bar Thumbnails – Progress indication bar thumbnails are visible when hovering over the progress indication bar. They can come in 2 sizes, small and medium. Collect high quality leads with your video’s by using the “Lead Generator” feature. Activate form – to enable lead generator form change the toggle to “On”. Create lead generator form – use the dropdown menu to choose your form type. You can choose between default form, use your own HTML form or insert a URL to form. Name – give name to your form. This will be visible to the users. Form fields – select the form fields you want. Formatting – choose when to show the form during the video. Allow users to skip the form – decide if your form is mandatory or not. Add text – add upper and/or lower text to appear on your form. 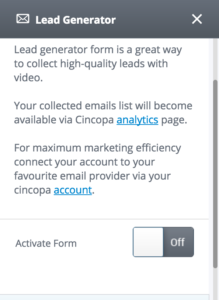 Connect form: for maximum marketing efficiency connect your account to your favourite email provider via your cincopa account. After authorization with your account, leads will be automatically added to the email list that you can select from the drop-down menu. How to Collect Leads from Video with Cincopa’s Lead Generator ? Vast XML – Paste the link to the VAST XML file into the corresponding field. 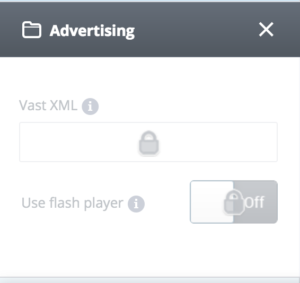 Use flash player – If you want to display VAST ads with .flv videos you can opt to use flash player by changing the toggle button to “On”.